This week’s “Photo of the Week” is of the 1924 “Ringling Brothers and Barnum & Bailey Combined Shows” Winter Quarters Circus Fire in Bridgeport, CT. This photograph is part of an 8-piece collection that depicts the aftermath of the circus fire. Barnum had problems with fires throughout his entire life, and his fire issues continued to plague his circus long after his death. 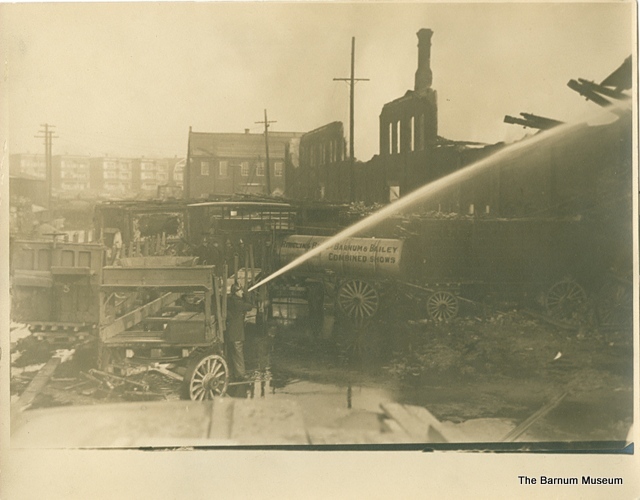 This picture shows a Bridgeport firefighter putting out a fire in one of the circus buildings that was located in Went Field Park, the home of the Winter Quarters for over 50 years. The park housed both domestic and exotic animals, along with many performers and trainers. The "Photo of the Week" highlights pictures from The Barnum Museum’s collection. These pictures are posted on our website at: www.barnummuseumexhibitions.org, along with a brief description of the person, place or thing within the picture. The "Photo of the Week" can also be found on Facebook. 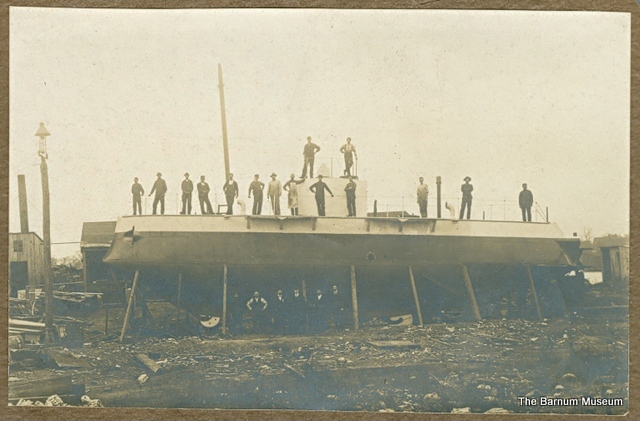 This week’s “Photo of the Week” is of the “Lake Torpedo Boat Company”. The company was one of the first producers of submarines for the U.S. Navy and was founded in Bridgeport, CT in 1901 by owner Simon Lake. There was a power struggle between the “Lake Torpedo Boat Company” and it’s rival, the “Electric Boat Company” to build for the U.S. Navy. In 1924, the “Lake Torpedo Boat Company” met it’s demise due to financial difficulties and was unable to continue producing submarines. 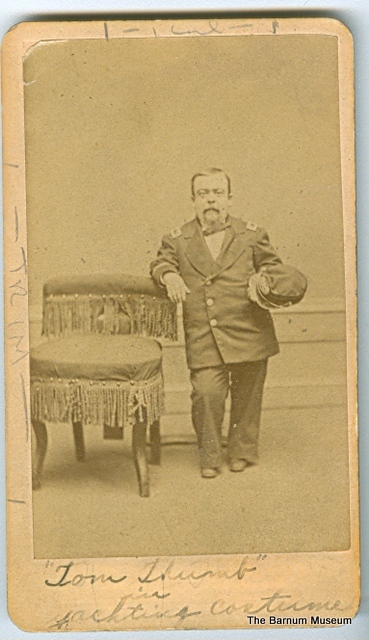 This week’s “Photo of the Week” is of Charles Sherwood Stratton, otherwise known as “General Tom Thumb”. Stratton was born in Bridgeport, CT on January 4th, 1838 and was “normal sized” until he was around 6 months old, when he stopped growing. When Stratton was 18yrs old, he was measured to be 2ft 8.5in tall and only grew about half a foot before his death at the age of 45. Despite being small in stature, Stratton was one of Barnum’s biggest attractions and became a very wealthy international superstar. He owned, and raced, a yacht called the 'Maggie B' which docked in Bridgeport. Here he is pictured in his yachting costume. This week’s “Photo of the Week” is of Arthur James Caley, otherwise known as “Col. Routh Goshen”. Although there is controversy over his birth date, it is presumed to be on May 5th, 1837. Goshen travelled with Barnum and worked in Barnum’s American Museum in New York City. He was billed by P.T. Barnum to be the tallest man in the world at 7ft, 11inches and weighing over 620lbs - an obvious exaggeration. Goshen was married three times and divorced twice. He had an adopted daughter, Frances Sylvester, who travelled with him and may have even danced for Queen Victoria. 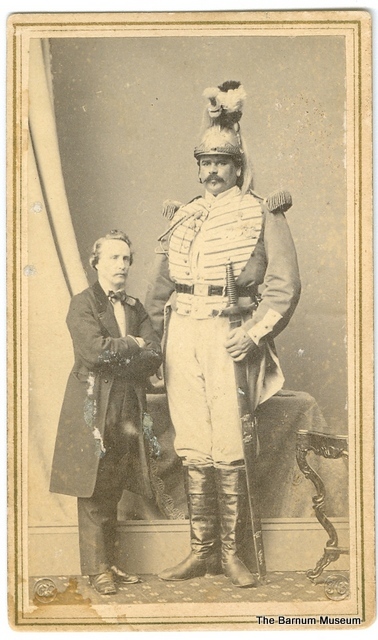 Col. Routh Goshen died February 12, 1889 in Middlebush, New Jersey and was forever immortalized as the Middlebush Giant. Nellie Keeler: 11 years of age, 28 inches high, weight 12 lbs. To be seen only in the Great P.T. Barnum Show. This week’s “Photo of the Week” is of Nellie Keeler, a.k.a. “Little Queen Mab”. Nellie was born on April 6th, 1875 in Kokomo, Indiana and in 1878 P. T. Barnum hired her as a child performer. When she started working for Barnum, she was just over 2ft tall and weighed only 11lbs. Much to everyone’s surprise however, when Nellie was around the age of 12, she had a growth spurt and by the time she was 16 she was a little over 5ft in height. In 1903, Nellie passed away at just 28 years of age from tuberculosis. 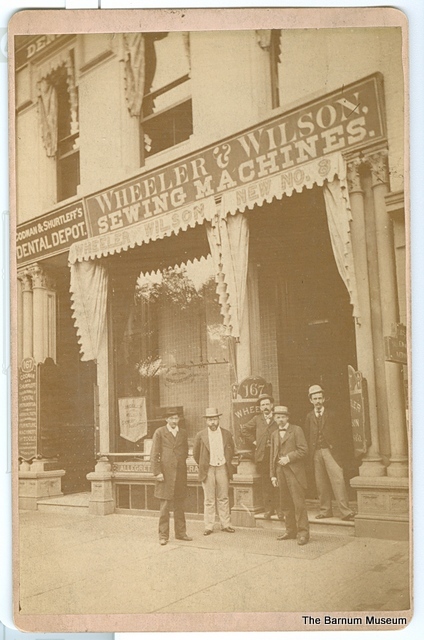 This week’s “Photo of the Week” is of the “Wheeler & Wilson” storefront in downtown Bridgeport, Connecticut. The sewing machine company moved from Watertown, CT to Bridgeport in 1856 and was located at the old “Jerome Clock Company” factory. Wheeler & Wilson sewing machines were a household name and changed Bridgeport forever by making it a fashion industry capital of Connecticut. 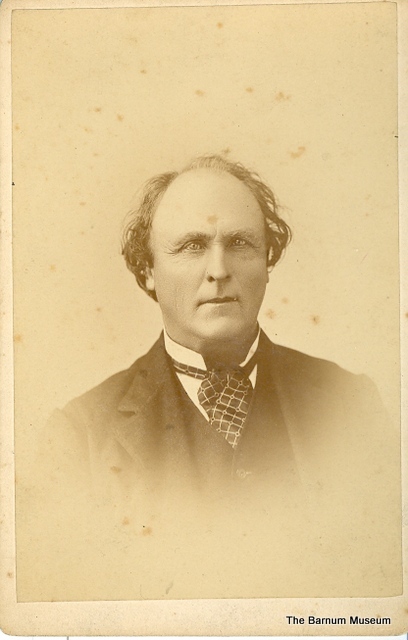 Nathaniel Wheeler, business partner with Allen B. Wilson who invented the cloth-feeding mechanism on the sewing machine, owned a large Gothic mansion in Bridgeport and was friends with P.T. Barnum. In 1905, Wheeler & Wilson was taken over by the “Singer Corporation”, who continued to make the Wheeler & Wilson #9 model machine until around 1913. This week’s “Photo of the Week” is of Buffalo Bill Cody performing his “Wild West Show” in Bridgeport, CT. The title of the post card reads “W.F. 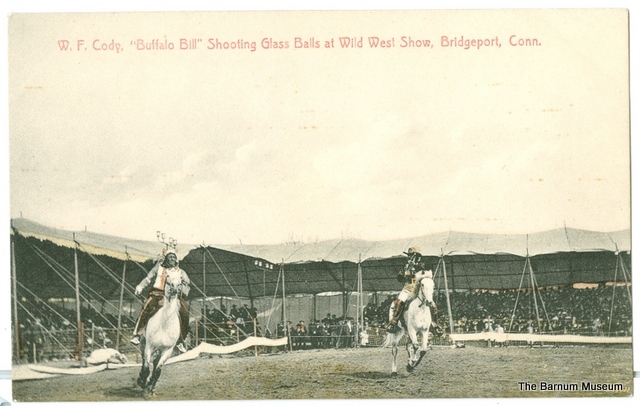 Cody, ‘Buffalo Bill’ Shooting Glass Balls at Wild West Show, Bridgeport, Conn.” The photo depicts two men riding white horses. One man is dressed in Native American attire, while the other is dressed in Cowboy attire. Buffalo Bill made a dozen trips over a span of 42 years to Bridgeport, including trips to winter his show with Barnum's circus, but it is believed that this photograph is from either his May 20th, 1907 show or his May 8th, 1912 show, due to the dating of the post card. Buffalo Bill was known worldwide and travelled throughout Europe and North America. This week’s “Photo of the Week” is of James W. Beardsley, the namesake of Connecticut’s Beardsley Zoo. In 1878 he donated over 100 acres of land to the city of Bridgeport in order to create Beardsley Park. The park was designed by Frederick Law Olmsted, famed for Central Park in New York City. During the years when Barnum owned his circus, he took his menagerie animals to exercise in Beardsley Park while they were wintering in Bridgeport. The park’s experience with exotic animals made it unsurprising when, in 1920, the park was turned into a zoo. 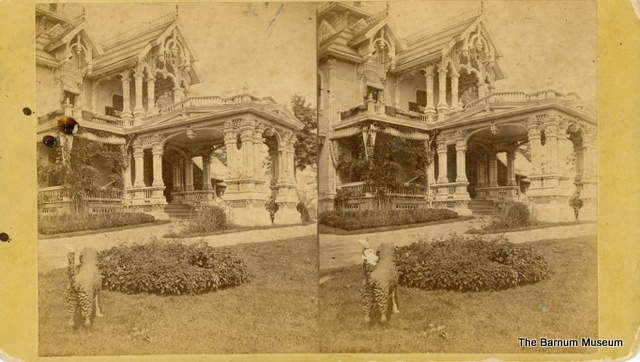 This week’s “Photo of the week” shows the entrance to Barnum’s third mansion, Waldemere. After Barnum’s first wife had died and he had remarried, his new wife expressed a desire for a new home. Likely she was uncomfortable in the mansion by the sea which was designed expressly for the woman who had come before her. In order to please his new wife, Barnum built her a new mansion, right besides Waldemere. While this mansion, Marina, was being completed the couple lived in Waldemere. When Marina was finished, Waldemere was knocked down. The "Photo of the Week" highlights pictures from The Barnum Museum’s collection. These pictures are posted on our website at: www.barnummuseumexhibitions.org/, along with a brief description of the person, place or thing within the picture. The "Photo of the Week" can also be found on Facebook. 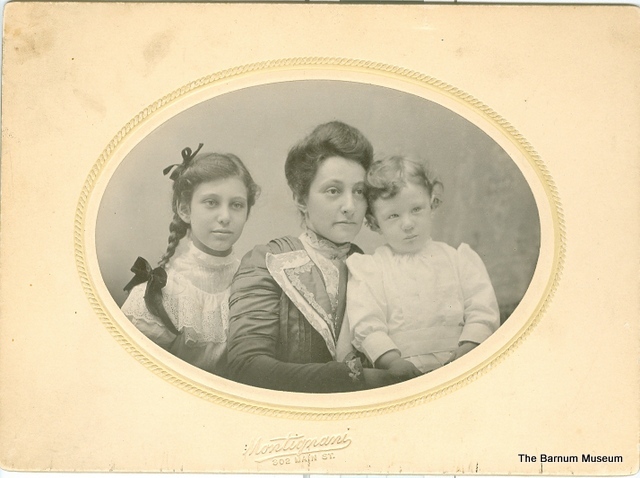 This week’s “Photo of the Week” is of an unknown mother and her children. The picture was donated to the museum without any information. All we know is that the family likely lived in or near the city of Bridgeport, as their picture was taken by Montignani, a famous photographer who had a studio in Bridgeport. It’s fun to imagine what life would have been like for this family, and what they would have seen when they walked the same streets, of the same city, in a very different time. The “Photo of the Week” highlights pictures from The Barnum Museum’s collection. 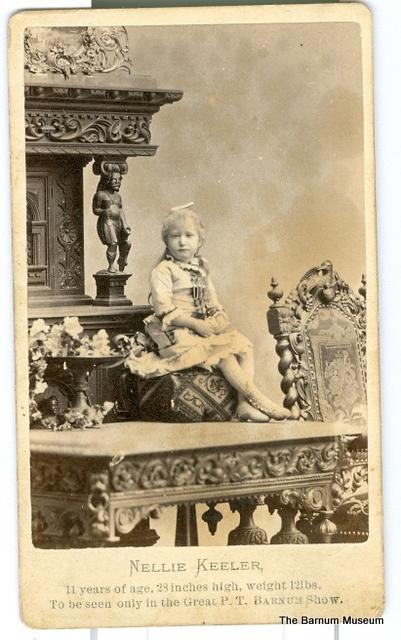 These pictures are posted on our website at: www.barnummuseumexhibitions.org along with a brief description of the person, place or thing within the picture. The “Photo of the Week” can also be found on Facebook.